The Recreation Program is for boys and girls ages 3 to 14 years old and strives to provide an environment that stresses a relaxed, fun-oriented approach to the game, to teach soccer skills, to provide competition for its members and to play the game in accordance with high standards of good sportsmanship and fair play. We welcome players (and volunteer coaches) from all towns and at all skill levels! Interested in learning about our Fall Recreation Program? LHSA offers both fall and spring recreation programs. Our fall recreation program occurs between late-August and mid-November. Our spring recreation program takes place in early April through early June. Online Registration and payment is available. Players are not considered officially registered until payment is received by credit card, e-check, or mailed check. Registered players will be assigned to a team about a week before the season starts (earlier if possible). Season schedules will be posted to our website about a week before the season starts, but game times and field locations are typically announced for each age group at the time of registration. The rules of competition can be found in our document library under Recreation. Players are required to wear a shirt, shorts, socks, shoes (cleats recommended), and shin guards. The registration fee for the spring program includes a team jersey, and for the fall program includes a team jersey as well as shorts and socks. Any equipment included in the registration fee will typically be distributed on opening day. You are also strongly encouraged to bring your own soccer ball. Size 3 balls are used for all players 8 and younger. Size 4 for all players age 9 to 12. The standard size 5 balls are for ages 13 and over. No jewelry is allowed. Earings must be taken out. No exceptions. Taping is not acceptable. Both the referee and coach must insist that earrings be taken out, or the player does not participate. This is true for all soccer across the board (rec, travel, high school, college, NJYS, USSF, FIFA) and is written into the rules of the game. Any player who leaves earrings in, even if padded and taped, is risking injury to themselves. Hopefully, removing earrings for an hour of game time should not result in the holes closing up. Parents of children with newly pierced ears should have antiseptic available so they can clean the ear and earrings (posts, studs) before and after the game. 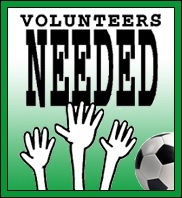 Lawrence Hamnett Soccer Association is a non-profit organization, run exclusively by volunteers. Over 700 children play soccer in Lawrence's recreation program each year, creating the need for countless volunteers. Your support is instrumental in the continued success of our organization. Coach or Assistant Coach: Experienced and non-experienced volunteers are encouraged to participate. Coaching classes & clinics will be offered to support you in your effort. All coaches are required to complete a background check and strongly encouraged to complete the "F" License coaching course through New Jersey Youth Soccer. We will be hosting monthly "F" License courses here in the Lawrenceville area and will be reimbursing our coaches in full upon completion. Concession Volunteer: We need a team of volunteers (kids and adults) who can make sure our concesssion stand is operational each Saturday. Perhaps you can help purchase and deliver supplies in advance (water, pretzels, gatorade, etc). Or be available to setup or breakdown the tent and tables on game day. Or be on-site to sell items and answer questions. Advertising/Marketing Volunteer: Want to help ensure the reach of our program to all families in the Lawrenceville area? Please consider joining our advertising/marketing team which involves being visible at community events, helping promote our program, and/or being a visible social media presence. ​Please to find out how you can contribute. We'd love to have you onboard! All games take place on Saturday mornings at the Armory fields off Eggerts Crossing Road beginning in early April through early June. We also offer a series of separate technical training sessions on Friday evenings at the Armory for an additional fee. Boys and girls born between 1/1/2004 and 12/31/2015 may register now for league play with weekly Saturday morning games ranging from 3v3 to 7v7 depending on age. See table below for specific game times. No weeknight practices. All skill levels welcome! Open to players from all towns! Professional training will be conducted by the New York Red Bulls training staff. Players are welcome to participate in either or both of these offerings...all at the same base price. When registering your player, you will be asked to select which offerings you choose to participate in. Again, the total cost is the same regardless if you choose one or both offerings. Players will be assigned to teams and participate in league play. All players receive a complimentary team picture and end-of-season medals/trophies. There will be no scheduled Sunday games. Games only would be played on Sundays if there are a significant amount of rainout dates that force Sunday make-up games. Location: All games will be played off Eggerts Crossing Road either at the Lawrence Intermediate School fields or Armory fields. It is the philosophy of the Lawrence Hamnett Soccer Association that no child should be denied the opportunity to participate in the Recreation program as a result of financial hardship that makes it difficult to pay the club dues.